U.S. transaction prices for Ford's F-series line, which includes Super Duty models, are up $2,100 over a year ago. DETROIT -- Ford Motor Co.'s Dearborn, Mich., truck plant, which assembles the redesigned 2015 F-150 with an aluminum body, is running at full line speed, giving a boost to Ford pickup sales. The F series, Ford Motor Co.’s most important vehicle line -- and the company’s cash cow -- posted sales of 54,370 in January, the highest January total in more than a decade. Ford brand and Lincoln sales totaled 178,351 in January, a 15 percent increase from January 2014. Ford brand accounted for 171,732 sales in January, a 16 percent gain over last year, while Lincoln sold 6,619 vehicles, an 11 percent jump. Two Lincolns, the redesigned MKZ sedan and the new MKC crossover, accounted for more than half of Lincoln’s sales last month. 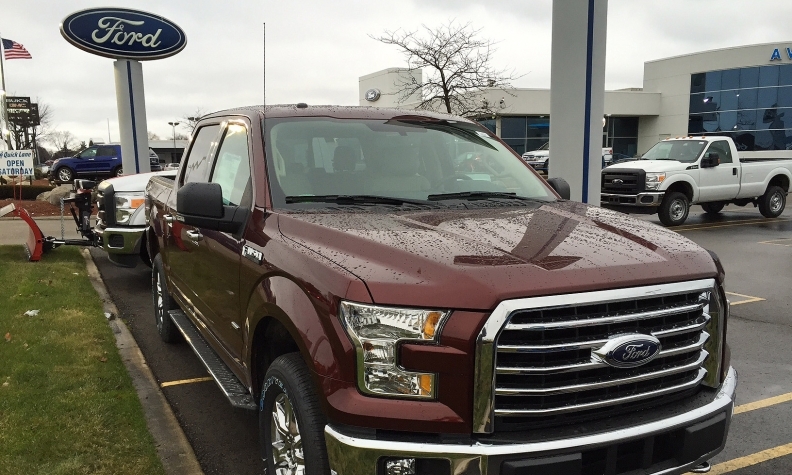 The 2015 F-150 is lasting between 9 and 12 days on dealer lots, Erich Merkle, Ford’s chief U.S. sales analyst, said today in a sales conference call with media and analysts. Meanwhile, Ford is converting its Kansas City., Mo., assembly plant to produce the 2015 F-150. The plant will be back in production in the first quarter on schedule, Merkle said. He added that transaction prices for Ford’s F-series line, which includes Super Duty models, are up $2,100 over a year ago. Of F-150 sales in January, Ford said 18 percent were of the new, aluminum-bodied pickups, while 82 percent were leftover 2014 steel-bodied units. In December, just 5 percent of F-150 sales were the 2015 aluminum trucks. Sales of the 2015 models are increasing as more of the new trucks reach Ford’s 3,000 U.S. dealers. The redesigned Mustang, available for the first time since the early ’90s with a four-cylinder engine, is also galloping off dealer lots. Sales more than doubled in January over a year ago, benefiting from Ford’s addition of the convertible version to the lineup. The Mustang’s total of 8,694 sales marked the car’s best January since 2007, and easily topped its rival, the aging Chevrolet Camaro, which had 4,991 sales last month. Of Ford’s four other top-selling car nameplates -- the Fiesta, Focus, Fusion and Taurus -- only the Focus was ahead of last year’s sales, with a 54 percent gain. Fiesta dipped 17 percent, Fusion was off 4.9 percent and Taurus dropped 23 percent from a year ago. Ford closed out January with an 87-day supply of vehicles, down from 111 days a year ago, but up from 72 days at the end of December. Merkle said fleet sales accounted for 28 percent of Ford sales in January.